By default, Safari will not allow users to use custom search engines (only Google, Yahoo, Bing, etc). But with the help of extensions, you can add Good Gopher as a search engine option and make it the default. 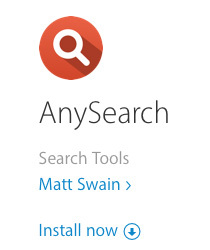 One Safari extension that will do this is "AnySearch." 1. Open Safari and install the AnySearch extension for Safari from Apple's extensions gallery (this link will only work in Safari on MacOS). Click on the "Install Now" link to add this extension to Safari. Once installed, the "Install now" link will change to say "Installed." 2. 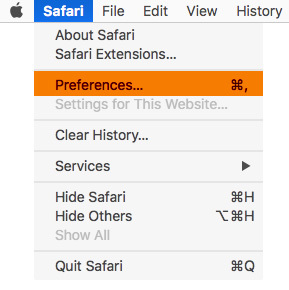 With the extension is installed, go to Safari's "Preferences" menu. 3. From the Preferences menu, click on the "Extensions" tab, then click on the "AnySearch" extension on the left. This will display AnySearch's customization options. Once finished, close the Preferences menu. That's it! 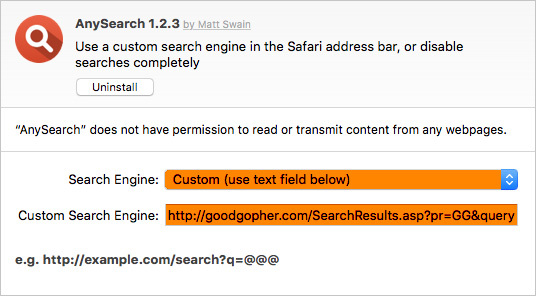 Good Gopher is now your default search engine when searching using Safari's built-in search bars. For more information, please see Apple's Safari extension support page.